What is Dry Needling and how can it help you be a better athlete? Last week, I had a traditional chest day for the first time in 3 months. I worked out with a buddy of mine who pushed me to do 6 exercises each for 3-4 sets. I was feeling fine the next day, a bit sore the following day, and holy ##@$% the third day. It was the worst delayed onset muscle soreness (DOMS) I have experienced to the point that I couldn’t even put my shirt on. You may have experienced soreness of this magnitude before: the kind that causes you to cuss when you get out of bed. You may wonder what recovery options you may have. The most common one is getting a massage, but honestly the results from a massage are usually short term and minimal. A lot of you may be familiar with acupuncture, maybe some of you have even tried it. Acupuncture is a treatment staple in Eastern medicine. If acupuncture is yoga, then dry needling is Crossfit. 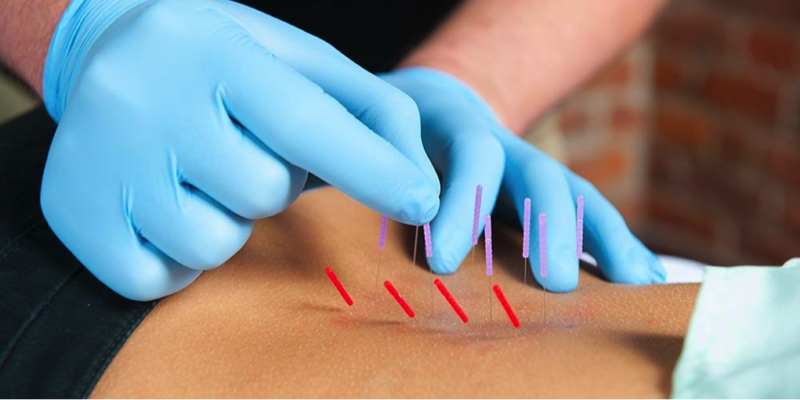 Dry needling is the Western medicine adaptation to traditional acupuncture. It involves using tiny needles and inserting them purposefully within a muscle. Dry needling is NOT acupuncture. The most common form of DN is trigger point DN. Trigger points are those “ropey” or taut bands that you strum over your muscles and are known to reproduce pain or discomfort. Common areas for trigger points are in your neck muscles, between the shoulder blades, in your lower back, or your glutes. With trigger point DN, we would target the center of these trigger points with intent of loosening up the muscle and increasing blood flow to the area. The blood flow brings all the good stuff, such as healing factors and pain relieving hormones, that allow us to recover asap. With more blood flow to the area, more recovery can take place sooner. Imagine trying to build a house: the bricks are healing factors and the house will be your muscle. If your assistant only brings you 10 bricks at a time, it’ll take forever to build your house. However, if he showed up with a bulldozer with 10,000 bricks at a time, then that house will get built a lot sooner right? DN is like that bulldozer! Another important benefit of DN is the relaxation aspect that it can bring. When people talk about “fight or flight” they are talking about your nervous system response to certain situations. Working in a cubicle = flight, while crossfitting with loud Avenged Sevenfold music = fight. During a workout you get so revved up, then you wonder why you have a hard time going to bed at night. Personally, one of the most beneficial uses I found for DN has been to harness that “flight” response and help you relax more. The sooner you relax, the more your veins/arteries relax, then the sooner you body starts to repair itself. From my experience, everyone responds differently. The benefits have far outweighed the risks and my clients cannot get enough of it. There are risks with everything you do and truthfully the risks are similar to manual therapy, or getting your teeth cleaned. Schedule a free consultation today (hyperlink http://www.unbrokenrehab.com/book-online/) to see if dry needling can help you in pain relief and accelerated recovery. To catch some of our demonstrative videos or learn more information, Follow us on instagram (hyperlink www.instagram.com/unbrokenrehab) and Like us on Facebook (hyperlink www.facebook.com/unbrokenrehab). Tune in to see our very own Coach JQ get dry needled.